REVIEW: Pendragon Theatre's Phenomenal Performance Makes For A Riveting Work of "ART"
“White has a tendency to make things visible. What: This quick-witted play digs into the essence of friendship. 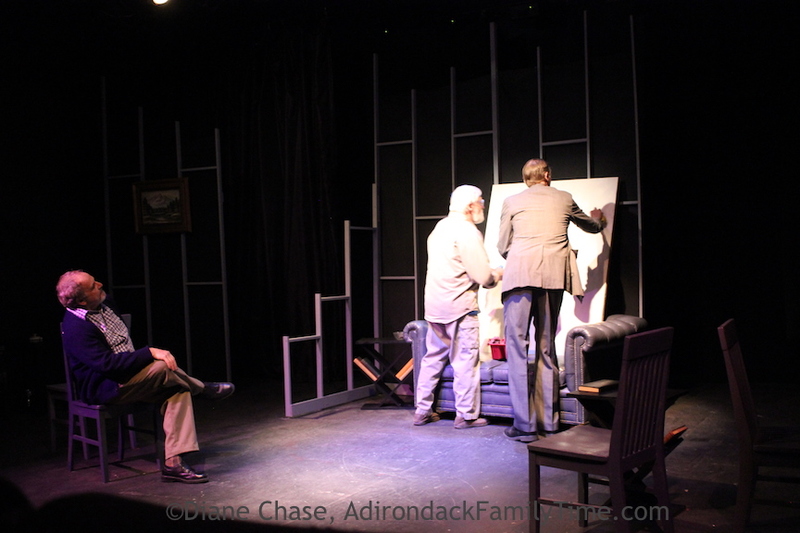 Three men in their New York City apartments test their friendships when one purchases a modern art painting. The painting is the catalyst that sparks opinions about what is art, but also what is friendship. Audience: Appropriate for older middle school students, high school students and adults. Not for young children. There is some language. MAKES FOR A RIVETING WORK OF "ART"
(SARANAC LAKE) I had the opportunity to see Yasmina Reza’s play ART at the Wydham Theatre in London’s West End the summer of 1998. It was brilliant with its West End glitz, glamour and all-star male cast. That particular cast and year took a bit of research, since I’ve seen quite a few plays since then. What hasn’t diminished from my memory was my pure love for this play. I love the simplicity of the sets and complexity of the emotions. I love how it brings together three very different men as it delves into an exploration of what is art, but also what is friendship. When I’m sitting in the audience of Pendragon Theatre anxiously waiting to see how this performance of ART will compare to my other experience, I am drawn to the monochromatic sets designed by Burdette Parks. There are no scene changes so the set is divided into three apartments, each slightly different. There are no knickknacks or throw pillows to add a “women’s touch.” These rooms are occupied by men. 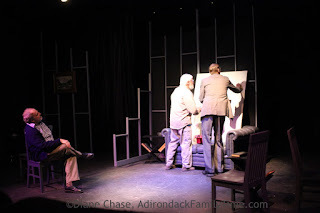 Burdette Parks slips between his numerous tasks in this production of ART, from set designer to director to actor with the ease of a professional. As challenging as all these roles are singularly, as the director Parks has brought together a trio of actors whose chemistry resonates on stage. Whether in comical desperation, fast-paced wit or pulsing frustration these men pull the audience along for an amazing ride. The soft lights highlight the only items of color: two pastoral paintings in an otherwise monochromatic palette. It’s a clever use of space as the apartments to the right and left are occupied by Marc and Ivan, friends to Serge who occupies the center stage. Not only do the friends surround Serge, but the use of space serves to block, bookend and support the different friendships depending on the dialogue. 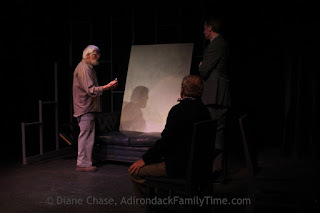 This comedy opens when Serge (Pendragon newcomer Peter Wilson) proudly shows his friend Marc (Burdette Parks, last seen as Mark Rothko in RED) his latest acquisition, a modern, seemingly all-white painting. Wilson’s Serge is straight-laced, stiff and angular. He is every bit the dilettante, trying to impress his friend Marc with the artist’s name, the painting’s resale value and justification for its $100,000 price tag. Marc leaves to meet their mutual friend Ivan, played to neurotic perfection by Jordan Hornstein, last seen in Pendragon’s production of The Seagull. Hornstein’s Ivan’s opinions change with the wind in his attempt to mediate. Hornstein plays Ivan with such heart. One moment his voice is strong and low as he finally bares his own feelings about the painting. The next moment his voice squeaks as he disappears behind his cardigan in frustration when he doesn’t feel heard. 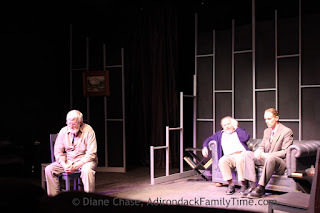 Though the whole play is riddled with glib sound bites, Ivan’s monologue concerning the woes of his wedding is both authentic and hilarious. In a rant he tries to please fiancé, parents and stepmothers all in the wording of the wedding invitation. Separately these three actors draw me into their story, but together they dominate the stage. The story is driven by how these friends communicate their fears, humiliations and feelings without ever being overly cloying. Marc may start out inflexible, Serge insecure and Ivan burdened, but soon each character morphs into stronger or more sympathetic versions of themselves. An offended Serge is no longer docile and strikes out at Marc’s personal choices. This is where Wilson shines, as Serge calls into question what Marc’s loves. Parks’ Marc seethes with anger as he sees his position as Serge’s mentor threatened. Parks has a gift that lets the audience laugh along with his confusion and resentment. By the end the men are at each other’s throats, each passionate with his own rightness. Serge diffuses the situation when he hands Marc a pen and grants permission for the painting to be defaced. I knew what came next and I still gasped along with the nearby audience members. Without ruining the ending, these friends come to a resolution and transition their relationship from resentment to a “clean slate.” As with the painting, any damage to their friendship can be mended. That may be the end of the play, but it isn’t the end of the conversation. 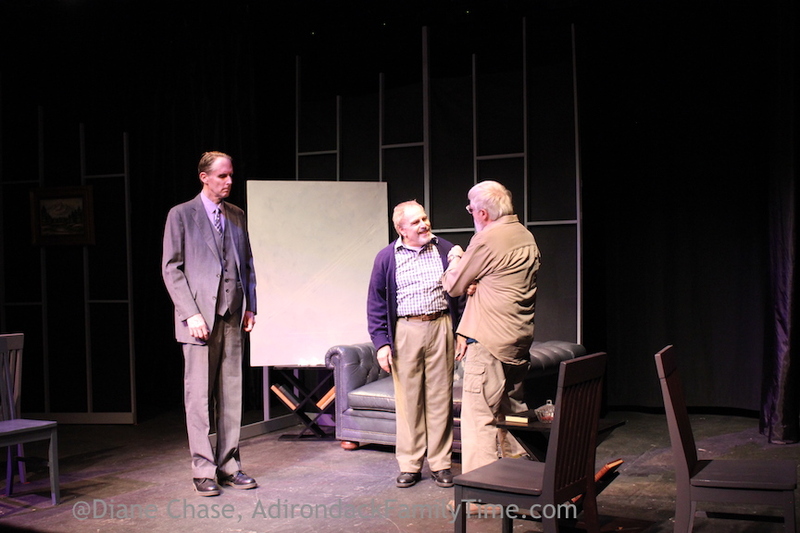 This trio of actors is phenomenal so treat yourself to a showing of ART. You’ll walk away with an appreciation for what makes us human. As I exited the theatre I talked with a patron about the value of art, friendship and communication and we agreed, "Appreciating a painting is the same as appreciating your friends. You don't have to always agree, but you need to respect the process." Though buying an all-white painting is not anything new or outlandish, the argument of what is considered art still remains. Kasimir Malevich 1918 “Suprematist Composition: White on White,” and Robert Ryman’s 1961 all-white canvas hang at the New York Museum of Modern Art while Robert Rauschenberg’s WhitePainting [three panel] is on display at the San Francisco Museum of Modern Art. This 90-minute performance has no intermission. 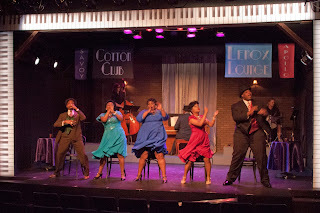 Remaining performances are June 3, 4, 10, 11, 17,18 at 8 pm and Sundays, June 5,12 and 19th and 2 pm. Tickets are $15/$22/$25 with all matinees seats set at $15. Enjoy!